Intrigued by the premise, I was hoping for a story that was cleverly plotted, keeping me interested in the characters and the twists and turns for this down on her luck, unlucky in love heroine Juliet. After a spectacular disaster of a music career, and desperately in need of funds, she poured all of her money into a café. Things were looking up until her fiancé ran off with her money and her best waitress – leaving her in the lurch. Old friend / crush / former employer offers a management gig at his café, one that is struggling financially and needs some work. So Juliet moves, drags out her “red-headed She Devil” alter ego and heads off to take up the revision of Java Jive. But by the end of the first day – the employees hate her, she and the chef have had huge issues, and oh yeah – he’s toes up in the dumpster. Who did it – why – and just how will the inept police force ever solve the murder unless she jumps in and investigates? Well – it was interesting, if wholly annoying at times. I don’t see the comparisons in the blurb working, mostly due to the lack of nuance and depth in characterization – bad guys were bad, good guys were good, and the two never quite met in the middle when Juliet, with her impulsive, brash and often thoughtless wandering put her in danger just as she stumbled onto clues and possible leads. Nuance is important, and when it is lacking, the characters become little more than caricatures and had me rolling my eyes more than once. Light yes, but amusing and engaging not so much –a bit frenetic, without my ever thinking that Juliet had any clues: I saw the culprit long before she did, and her pathway to the answer didn’t feel carefully plotted or planned. When you add in a love triangle (why?!!!) and some truly Benny Hill moments, this was a struggle to find a reason to be intrigued. Narration was provided by Callie Beaulieu, and the first time I’d encountered her work. While we don’t have a solid (she is X years old) for Juliet (at least not that I remember) her personality leads me to think far younger than the voice of the narrator would suggest. While it was a workmanlike narration, and characters were easy to distinguish, accents and tempo were decidedly missing, seeming to emphasize consistency and adding humor rather than telling the story. It wasn’t horrible, and I can see why she’s frequently narrated titles that trend to self-help and non-fiction, as her enunciation is clear and reasonably precise, less adapted to fiction and fast-paced banter so integral to entertainment. Overall – if you aren’t expecting nuanced characters or a twisty story, with a narration that demands you pay attention to not miss anything, you’ll find this fits your needs. As it stands, I’m not intrigued enough to continue with the series. 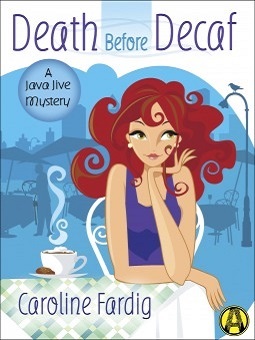 Perfect for fans of Janet Evanovich and Diane Mott Davidson, Caroline Fardig’s captivating new mystery novel takes readers behind the counter of a seemingly run-of-the-mill coffeehouse . . . where murder is brewing. After her music career crashes and burns spectacularly, Juliet Langley is forced to turn to the only other business she knows: food service. Unfortunately, bad luck strikes yet again when her two-timing fiancé robs her blind and runs off with her best waitress. Flushing what’s left of her beloved café down the toilet with her failed engagement, Juliet packs up and moves back to her college stomping grounds in Nashville to manage an old friend’s coffeehouse. At first glance, it seems as though nothing’s changed at Java Jive. What could possibly go wrong? Only that the place is hemorrhaging money, the staff is in open revolt, and Juliet finds one unlucky employee dead in the dumpster out back before her first day is even over. The corpse just so happens to belong to the cook who’d locked horns with Juliet over the finer points of the health code. Unimpressed with her management style, the other disgruntled employees are only too eager to spill the beans about her fiery temper to the detective on the case. Add to the mix a hunky stranger who’s asking way too many questions, and suddenly Juliet finds herself in some very hot water. If she can’t simmer down and sleuth her way to the real killer, she’s going to get burned.